Before you head out tonight, give a thought to tomorrow morning. 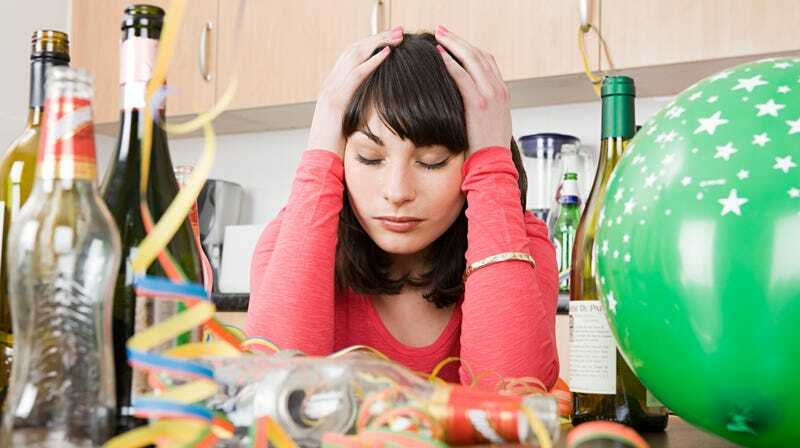 New Year’s Eve is a notoriously hard-partying evening, often fueled by headache-inducing champagne. You may be planning ahead to a carb-rich New Year’s Day breakfast to aid your impending hangover. But will that really help? Not necessarily, according to the BBC. While many of us swear by day-after fast-food breakfasts and the like, the BBC states that “very little, other than the tincture of time, seems to work” to help right our wronged body after a late evening full of too much wine and too much song. Part of the problem is that no one seems sure how to qualify a hangover, especially as the symptoms seem to arise after alcohol has left the body, and effects vary wildly among certain people, “in everything from basic biology to drinking amount to speed—not to mention age, which many suspect makes it more difficult to get away scot-free from a night of over-indulgence.” Sad but true. Besides age, possible culprits include dehydration and being over-tired, even hormones, which can result in the hangover-familiar fuzziness and grogginess. While many indulgent types point to certain types of food as their saving graces the day after—our own Hangover Helper series offers everything from mustard to ginger juice to Cobb salad—the BBC maintains that there is no proof that these types of edible cures are effective. It suggests that “rest, water, and aspirin is likely to be the best treatment for some time to come.” Or, with the big night just ahead, be a little wiser this year: Drink lots of water between drinks, and stop before getting really polluted. And if you can’t bear to look at a drink tomorrow, may we suggest considering Dryuary to kick off a blessedly alcohol-free month?